Our beloved blogger Deja Pseu, posting her reports from her most recent Paris trip, wrote "Much to my chagrin, I did notice that the only other women wearing Hermès carrés were quite a bit older and very conservatively dressed." Commenters confirmed her suspicion: the classic carré has been abandoned by stylish Parisiennes under, uh, seventy. Or eighty. Hermès scarves have always been bourgeois, proper "lady" wear, occasionally borrowed to wear ironically by teenaged daughters, but jamais cool. If you've never liked them, I'm not trying to convert you (salut, lagatta!). And I have disliked them on some women, even while wearing one! I too had noticed their exile on my last several trips. One clue was the ample supply of Hermès scarves in the resale shops. My theory is that those who once wore the scarves don't like Hermès' rapid expansion, preferring to hold their artisanal patrimony closer to home. The thinking seems to be, "You can buy them at many major airports, and (even worse) online. Too common, too 'global'". Perhaps they are the canary in the coal mine, warning of the commodification of yet another of their great houses. You can wear yours anyway, very casually and functionally. I mean, if the Queen can blow her nose into hers (as played by Helen Mirren in the film "The Queen"), mine can ride knotted inside a sweater, with jeans, or leaven my usual black-pants-and-cashmere-vee uniform. On a dull day, the snap of a fine silk print warms my spirits like a portable solarium. Shown, me on this gloomy morning in "Les Parisiens", a very graphic pattern that includes a café dog. Try it with your favourite casual skirt and chic shoes, like the ensemble shown– hardly proper biddy gear! Hermès' magazine, Le Monde du Hermes, pairs scarves with austere shirts or solid sweaters. Wear one with a tee and jeans, or as a belt. The suit-and-scarf, a self-conscious presentation, screams 1980s realtor. Even a scarf worn with a constructed jacket feels a bit time-warped unless it has the relaxed attitude of a vintagey tweed or jean jacket. I still like the scarf tied to a bag. Forgo complicated tie effects with lots of pleats and puffs. A carré ought not be tortured into a flower shape. If you're simply no longer a fan, store them for a grand-niece, granddaughter or iconoclastic grandson who will treasure yo ur bequest. Stopping by the calm Hermès boutique today with Le Duc, I fell in silk-print-love with one pattern. Despite reading Pseu's comment barely an hour before, I'd be delighted to enjoy one more addition. The carré (or other shapes) has been his and my sons' traditional gift for decades, marking anniversaries, birthdays, Mothers Day, Christmas or achievements. One of the staff, who remembers helping the shy, excited six-year-olds choose a special gift, became a dear family friend. Looking like a conservative Parisian grandmother is not an abhorrent outcome, even if I'm not quite not there yet. "Bourgeois" as a label never bothered me, because I know these markers provide surefire camouflage for true subversives. Waxed jackets, sailing shirts, oxfords, samovars, leather sofas, and Hermès scarves: these items content me far more than the strenuously hip. I'm not going to wear a dress over jeans at my next decade birthday, I'm wearing this. Great post, thanks Duchesse, and thanks for the encouragement. I do find that I'm more comfortable in mine when I pair them with casual wear. (Note: they're also great for mitigating a too-low-for-the-office neckline.) There's one other woman in my age group at my office who has a small collection; we run into each other by the elevator and admire each other's and swap the stories behind their acquisition. I'm also finding that the smaller "vintage" scarves don't have quite the formality of the standard carrés. Pseu: I don't buy the 'vintage' as the size is not flattering on me, a tall. large woman (think Julia Child :)) It looks a bit lost. BTW when I was there yesterday saw some very graphic patterns that would surprise those expecting only equestrienne or traditional prints. This is a great post. Although I love the scarves, I stopped wearing them for a while as they looked, on me at least, too stodgy with work clothes. Since then I have rediscovered the attraction of wearing them in casual ways. Bravo, Duchesse -- well said! I agree with you. Since we're undeniably ageing anyway, there are indeed worse looks than that of a conservative Parisian grandmother. My single Herm&grave;s scarf (I'm not yet lucky enough to have more) gives me great pleasure with its rich colours, sumptuous texture and wild psychedelic 60-s hearts, flowers, and swans pattern (yeah, not so conservative). Like you, the label "bourgeois" doesn't terrify me, and like you, the pairing with casual wear sets up a playful dynamism that, for me anyway, is grounded by confidence in the scarf's enduring quality. And even though I'm short (not yet 5'4" but I live in hope), I prefer the larger size -- seems somehow less "fusty" to/on me -- and I generally fold into an oblong anyway. I particularly like them as worn by the guy with the heavy metal t-shirt. That I could do. Although my only rock tshirt is Bruce Springsteen, so I'm afraid I'd be ratcheting the edginess way down. Love the phrase "strenuously hip"!! 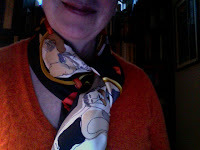 I don't have a Hermes scarf, but I can see the attraction, especially Deja Pseu's Paris scene with the cute rooftop mice. Perhaps if I ever obtain one I'll wear it as headscarf like your example or as Queen Elizabeth does. Like I just got out of my Landrover on my country estate! Like you, Pseu and others I now wear my Hermes scarves exclusively with casual wear. But since I am a SAHM, that's what I mostly wear anyway. I must admit that I love to riff an equestrian theme now and then, this fall it's the jodhpur style slacks from Talbot's with either a v-neck cashmere sweater or a long-sleeved white tee with a brown riding vest. Add an Hermes carre to that and it's a good look for casual errands around town. Duchesse: I agree they look best with casual clothes and love to wear mine folded into an oblong and tucked under a quilted vest or coat for a little color. Mardel: The more casual, the better! materfamilias: I know that pattern, not conservative at all and seems to me to suit your personality. Laurie-Ann: Betty Draper, I presume? I´m fond of Hermes and you might guess it by looking at me ;). Equestrian stuff-yes ! I´d also pair mine with casual wear. Hermes scarves are expensive, there are many look a likes which only cost a fraction of the real one. Maybe the H scarf is not trendy enough? I´m just wondering how long will the craze over the Birkin/Kelly bag last ? Duchesse, I longed for a Hermes, bought one...and probably only wore it three times in ten years. It was a vintage, "Aux Champs", with the full equestrian motifs. Saving it for a rainy day? Is it really about the scarfs, or is something more going on? There are nameless scarfs everywhere you look, and yet we can sense the demise of this icon. I always wonder about things that have been around for.. well not forever, but a long time that fall out of fashion. I know my father missed his hat that he had looked so great in for decades. Suddenly, in the 60's men just didn't wear them any more. And they never came back. Put the white gloves no woman would be without in the same category. They never returned. And yet these were items that had endured for decades, not fleeting fashions. It always pains me to live through the demise rather than the heyday. I think that the over marketing of some items today kills off a classic, at least temporarily. Maggie, you are right about that. At least in formal business or political life, one simply doesn't see men wearing hats, even in cold countries. They have a smart overcoat over their suit and a muffler in fine wool or cachmere underneath, but no hat. The last Canadian Prime Minister I remember photographed in a hat in anything but a sporting or outdoorish setting was Trudeau; he was enough of a dandy to get away with that, and he was balding - not a matter of vanity, though Trudeau was certainly vain he knew he looked interesting with or without a full head of hair - but a simple matter of temperature. Some people have played down the Kennedy hatless inauguration's influence, but it certainly had a worldwide media impact. About the only gentleman wearing a hat at Obama's inauguration was Ted Kennedy, who was very ill, and much older. And that January day, the temperature in Washington was as low as in Ottawa's, unusually cold for down there. I have no doubt but that the Hermès carrés will return as prized vintage items as the quality of the printing and the care that goes into the designs, whatever one thinks of them, are worthy of artistic reproductions. Do people think that it is because the brand is devalued by globalisation, and the fact that it has become aspirational among affluent women in East Asia, the Middle East and elsewhere? Is this a clue to the "anti-snob" snobbery about it chez certaines Parisiennes? metscan: The "lookalikes" have always been glaringly obvious to me. Maggie: I don't think they will go- or if so, all scarves will go, in the manner of men's dress hats. Other items, like structured handbags, come and go from style but are always around for those who want them. lagatta: I loved PET's hats! You have written what was on my mind. The French can be terrific snobs, and I've heard a few remark about the desirability of Hermes goods "once every woman in China has one". One of Hermes' former associates told me that woman refused her bag order when she learned that a woman of another race was coming in to pick up her identical style. I don't think that the lack of Hermes carres in Paris is due to the brand going global. I just think that the price is just too high for the average upperclass or middleclass French woman to afford. They are ridiculously expensive, and French women are, for the most part, careful with their money. Love your comment about camouflage for the subversive! I've always wondered what became of that scarf after "the Queen" used it as a handkerchief! Belle: I wonder! I knew women who saved and managed to buy on very modest budgets. Frugal: I've sneezed on a few; the cleaner's is the next stop. Forgot to say "congratulations" to your adorable son on his graduation. Are your boys identical twins? Frugal: Thank you. No, they're fraternal. They win bets in bars because they look so dissimilar. Love that last picture Duchesse! Simple and classic and beautiful. Thanks for sharing. I so want one and one of their blankets too or maybe two of their grey blankets. I love reading your posts--in part, I think, because your problems are so different from mine. :) Scarves may go out briefly, but I don't think they'll ever stay out. There's something too wonderful about a square of beautiful fabric whose only purpose is to be as beautiful as it possibly can. Just found this post, though I'd read Deja's at the time. I'm building a collection of "vintage" (aka USED - I am not ashamed of this) older H scarves and love them. As to being passe, hey, I'm 40 and live in the American midwest - I likely am passe to Parisian tastes already! But as a graphics and textiles nut these lovely scarves liven up my boring office suits and plain tops and cardigans - never one afraid to go against the grain, I will endure! Artful Lawyer: Well said, and enjoy. 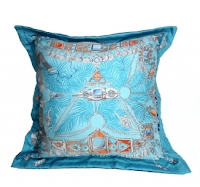 Among the many Hermes designs, I always look for those I find exceptional. Amazingly, I have located two vintage carres at one local thrift store in my town. How excited was I? Having checked every possible resource online, it appears they are authentic. One, a white Mineraux, is mine to keep. I sold the other one. I feel incredibly lucky. sallymandy: Great find! Someone had no idea what they were, but you did!